Volatile stock markets, pricey real estate, insecure trust funds – the time has come to move away from intangible assets and invest in pleasure. The pleasure of owning luxurious accessories and noble objects to use for exceptional occasions may turn out to be more profitable than other investments. 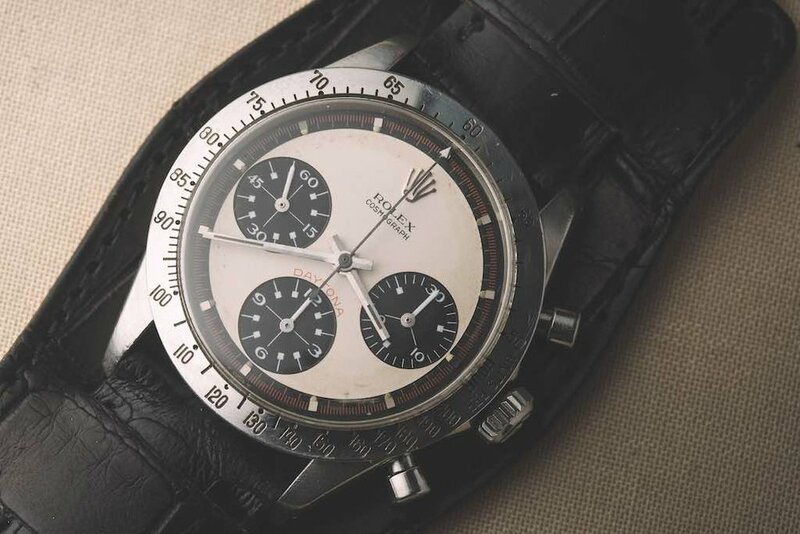 A legendary timepiece, elected “most iconic wristwatch of the XXth Century,” Paul Newman’s Rolex Daytona set a world record as it was auctioned in New York for over 17 million dollars in October 2017, after a twelve-minute bidding war. Purchased in the late 1960s by Paul Newman’s wife Joanne, this relatively simple watch, a stainless-steel chronograph with an exotic dial, changed the game for watch collectors and vintage markets; the product of the sale was used to finance large projects of several Newman charity foundations. It was a dream incarnation of major profit gain with a magic icon. A true passionate expert on watches, brands, and the luxury industry, Louis Westphalen, Head of Digital Marketing and Heritage at Breitling in Switzerland, describes the process of investing in precious timepieces not only as a money maker, but also as a source of happiness. Like Paul Newman’s Rolex, vintage timekeepers can be worn and accompany their owners over a long period of time, unlike vintage cars which require large storage spaces or vintage wines which are gone once enjoyed. Should one want to maximize the financial profit, Wetsphalen recommends to aim for rarity. Ultimate manufacturers such as Patek Philippe intentionally limit their production to small series, hence maintaining highly praised timekeepers. Overall, look for rare features, like vintage watches branded with both the manufacturer and the retailer’s names – a popular trend before brands expanded their branding efforts and overpassed retailers’ notoriety. Sign your looks with the audacity of distinguished models such as Audemars Piguet’s Royal Oak. Enjoy your quest for enameled or black dials, which are very in-demand as of late. Bargain-hunt small sized watches, like historic 32mm-dials, an industry average in the 1950s, now upscaled to 40mm for contemporary pieces. Seek for barely used materials, such as antique timekeepers made from platinum (a difficult material to work with) or elegant and dressy designs amazingly crafted in steel, to comply with specific religious beliefs. Bare in mind that rose gold was underused in the 1950s, to the benefit of yellow gold. There’s no steadfast rule for this. Major auction houses hold vintage sales and feature collections of most high-end brands and expensive models, adapting their catalogue to their local audience. Geneva and New York collectors praise vintage pieces, whereas auctions in Dubai and Hong-Kong perform better with modern timekeepers. As for contemporary art’s major auctions, famous collectors like American Eric Ku or Italian Davide Parmegiani make the market; visit local auctions in more humble houses to unearth accessible timepieces. Investment is about your own pleasure, so indulge with vintage pieces that highlight the incredible craftsmanship of dedicated watchmakers. Today, computers conceive of the most complicated mechanisms, whereas vintage chronographs have both sophisticated aesthetics and technical prowess done by hand – a lesson of humility! For modern pieces, favourite industry icons are enhanced with a modern touch: all prestigious manufactures revisit their timeless classics, like Breitling with the ageless Navitimer or Panerai with the Luminor Logo, introduced with six new versions during the Salon International de la Haute Horlogerie in Geneva in January 2018. Focus on wearable watches, i.e. wristwatches as opposed to pocket ones, or pay a tribute to singular savoir-faire and authentic creations, with exceptional pieces issued by manufactures such as Bovet 1822, which features patented Amadeo® convertible cases, allowing a wristwatch to be transformed into a table clock, pocket watch, or pendant watch. As for any investment, knowledge and passion are the keys to success. Diving into the magical dimensions of luxury, rareness, technicity, and exceptional craftsmanship, revisit the traditional cold-hearted investment, but add in emotion.